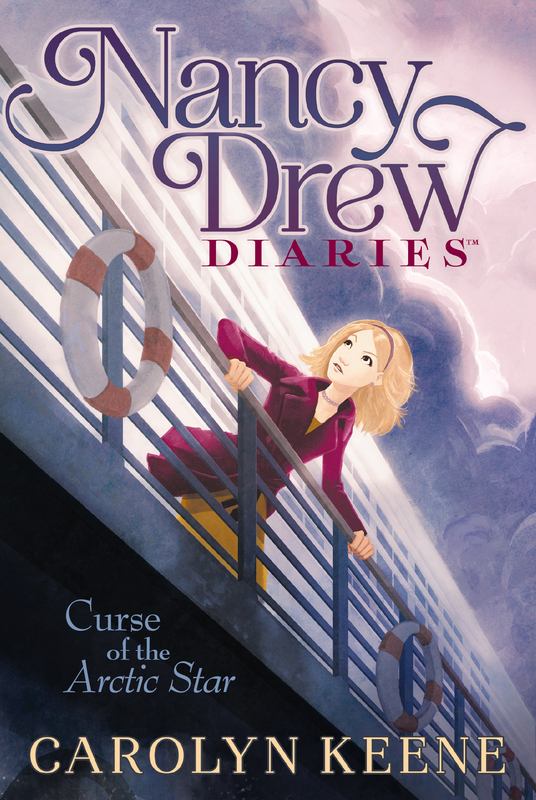 Nancy and her friends must navigate a cruise ship crisis in the first book of the Nancy Drew Diaries, a fresh approach to a classic series. Nancy, Bess, and George are cruising dangerous waters on a tour of Alaska. Becca Wright, an old friend of Nancy’s, is the Assistant Cruise Director of the Arctic Star, a posh new ship. But Becca needs Nancy’s help when strange things keep happening aboard the opulent ocean liner: The swimming pool becomes a floating grave; a famous passenger is threatened; and even the seemingly innocent mini-golf course becomes a perilous playground. With the majestic and mysterious Alaskan scenery as a backdrop, Nancy and company have to find out who’s trying to sabotage the maiden voyage and why. “NAME AND CABIN NUMBER, PLEASE?” THE efficient-looking porter asked, reaching for the large green suitcase sitting on the dock beside me. The porter smiled. He was a short, muscular man dressed in a tidy navy jacket with silver piping and matching shorts, with a name tag identifying him as James. Every employee of Superstar Cruises wore some variation on that uniform, from the driver who’d picked us up at the Vancouver airport to the woman checking people in over at the gangway. I watched as he scribbled the letters HS on a bright purple tag, then snapped it onto the handle of my bag. He lifted the suitcase as if it weighed nothing, even though I knew that wasn’t the case. I’m no fashion plate, but a girl needs plenty of clothes for a two-week Alaskan cruise! Then he set my bag on a metal cart along with at least a dozen other suitcases, trunks, and duffels. “Major understatement,” I replied. The Arctic Star was absolutely massive. We don’t see too many cruise ships in our midwestern hometown of River Heights, but I was pretty sure this one was even larger than most. Just then I heard a scuffle nearby. “Hey, give that back—I don’t want to check it!” George Fayne exclaimed as she grabbed a grungy olive-green duffel bag out of another porter’s hand. George is my other best friend. She’s also Bess’s cousin, though most people find it hard to believe they’re related, since the two of them couldn’t be more different. Exhibit A? Their luggage. George’s consisted of that ugly duffel, a sturdy brown suitcase that looked as if it had been through a demolition derby, and a plain black backpack. Definitely the functional look, just like her short dark hair, faded jeans, and sneakers. Bess, on the other hand, had a matching set of luggage in a nice shade of blue. Tasteful and pulled together, like her sleek, shoulder-length blond hair and linen dress. “Hi, Alan!” I said loudly, cutting her off as I noticed a guy hurrying toward us. I hid a smile. About a month earlier, Bess and George and I had been having lunch at one of our favorite cafés when George noticed a guy staring from a nearby table. He was maybe a couple of years older than us, with wavy brown hair and wide-set gray eyes. When he realized he’d been caught, he came over and introduced himself as Alan Thomas, a student at the local university. He apologized for staring and explained that it was because he couldn’t take his eyes off Bess. That kind of thing happens to Bess all the time, so I didn’t pay much attention. She’s not the type of girl who gets swept off her feet by just anybody. But apparently Alan wasn’t just anybody. He’d taken her on a romantic picnic for their first date, and the two of them had been together ever since. It was nice to see Bess so happy, even if I secretly thought Alan was a little goofy and overly excitable. George thought so too, though with her it wasn’t such a secret. He wasn’t the only one. Just a few short days ago, I’d been wondering what I was going to do with myself for the next month while Ned was off being a camp counselor and my dad was busy with a big case. River Heights is kind of sleepy at the best of times. This summer? It was downright catatonic. Then Becca Wright had called, sounding frantic. That was my first clue that my summer was about to change. See, Becca is just about the least frantic person I’ve ever known. Just a couple of years out of college, she’d already landed the plum job of assistant cruise director for the maiden voyage of the Arctic Star, the flagship vessel of brand-new Superstar Cruises. Having known Becca for years, I was sure that was mostly due to her work ethic and friendly, upbeat personality. Although I’m sure it didn’t hurt that her grandfather had been a bigwig executive at the venerable Jubilee Cruise Lines. He’d retired a few years back, but he still knew just about everyone in the business. So why the frantic call? Some suspicious things were happening at Superstar Cruises, and Becca was afraid someone might be up to no good. Naturally, that made her think of me. See, my thing is solving mysteries. Big ones. And small ones, like the case where I’d first met Becca, which had involved finding her family’s runaway dog. And everything in between. So which kind of case was this? I wondered, glancing up again at the gleaming white ship looming over the dock. Was someone really out to mess with Superstar Cruises like Becca seemed to think? Or was it just new-job jitters and a little bad luck? “Nope.” I smiled back at him. Real mystery or not, I was glad that Becca had called. My friends and I were about to set out on the all-expenses-paid cruise of a lifetime! The four of us joined the line waiting to board, which was growing with every passing second. George stood on tiptoes, hopping from one foot to the other as she tried to see how many people were in front of us. “Um, the line’s moving pretty fast. I’m sure we’ll be aboard soon,” I said quickly. The last thing we needed was for Alan to start blabbing to the ship’s employees about the whole contest-winner thing. Mainly because it wasn’t true. “Why are you looking at me?” I said. “I’m not that forgetful, even when I’m—” I caught myself just in time, swallowing the last few words: even when I’m investigating a case. “Um, even when I’ve just crossed a couple of time zones,” I finished lamely, shooting a look at Alan. Luckily, he wasn’t paying attention. He was digging into the pockets of his Bermuda shorts. He rushed off, disappearing into the throng of passengers, porters, and bystanders on the dock. George watched him go with a sigh. “Shh,” I cautioned her, glancing around quickly. “Yeah. Like I said. Nerd,” George said. I ignored their bickering, realizing I didn’t have to worry about anyone overhearing us at the moment. A red-haired young man had just arrived at the dock, and about a dozen other people, from little kids to an old woman with a walker, were pushing and shoving and laughing loudly as they all tried to fling themselves at him at once. Almost every single one of them had bright red hair and freckles. Bess followed my gaze. “Family reunion?” she murmured. “Sounds like a mystery to me,” George agreed, kicking at a loose board on the dock. I nodded slowly, still not entirely convinced. Brock Walker was an A-list actor who’d starred in a popular series of bad-boy comedy-action films. But in real life he was supposed to be a hard-working, down-to-earth family man, married to his high school sweetheart, with a couple of kids. Definitely not the type to flake out on a commitment, at least according to his reputation. I stopped short as Bess cleared her throat loudly. A moment later Alan arrived, apologizing to the people in line behind us. I forced a smile. Having Alan along was definitely going to make things more difficult. That hadn’t been part of the original plan. But when he’d heard that the three of us had won a free cruise to Alaska in a four-bedroom suite—cover story, remember?—he’d begged to come along. As an environmental studies student at the university in River Heights, he’d pointed out that Alaska was the perfect place to get a jump-start on his sophomore-year research project, and he’d never be able to afford that kind of trip on a college kid’s budget. Especially when he lavished what little spare cash he had on his new girlfriend, Bess. Okay, so he hadn’t actually mentioned that last part. He hadn’t had to. Bess had invited him along and told us we’d just have to deal with it. The girl seems sweet and agreeable most of the time, but she’s got a backbone of steel when the situation calls for it. Soon we were inside, being checked in and issued our ship ID cards. “Enjoy your time with Superstar Cruises!” the smiling employee told us. “Leave it to me,” Bess murmured back. Alan had just moved away from the check-in desk to tuck his ID into his wallet, but he looked up quickly. “Did you say something?” he asked Bess. She didn’t have to ask twice. Seconds later they were strolling out of the check-in area hand in hand. George shook her head as she watched them go. George glanced around as we emerged into what appeared to be a sort of lobby area. It was carpeted in red, with murals on the walls depicting famous Hollywood landmarks. A pair of winding, carpeted staircases with gleaming mahogany banisters led upward, with a sign in between that showed the layout of the entire ship. I barely had time to glance at the sign before a smiling young female employee rushed toward us. She was dressed in shorts and a piped vest and was holding a tray of tall, frosty glasses with colorful straws and umbrellas sticking out of them. “Whatever. A girl’s got to stay hydrated.” George took another big sip of her smoothie as we hurried upstairs. A couple of flights up, we found the lido deck. It was a partially shaded area spanning the entire width of the ship, and appeared to be where all the action was at the moment. As we emerged out of the stairwell, we almost crashed into another employee. This one was a lean, tanned man in his late twenties with slicked-back brown hair. There was more, but I didn’t hear it. I’d just spotted Becca halfway across the deck chatting with some passengers, looking trim and professional in her silver-piped navy jacket and skirt. “Save me a spot on those kayaks,” George called over her shoulder as I yanked her away. “Ladies!” someone called out cheerfully. Suddenly we found our path blocked by yet another uniformed employee. This one was a short, skinny guy with a wild tuft of blond hair and a slightly manic twinkle in his big blue eyes. “Hollywood Suite, right?” he asked. George was already examining the pamphlets eagerly. I could see that it wasn’t going to be easy to shake Max. “Certainly, Ms. Drew!” Max beamed as if I’d just asked him to be my best friend. “I’ll take care of it right away. Just text me if you need anything else.” He handed us each a card with his name and number on it, then scurried away. This time we actually made it over to her. I hadn’t seen her in a couple of years, but she looked pretty much the same—curly dark hair, sparkling brown eyes, a quick smile. She was chatting with a rather weary-looking couple in their thirties. The man wore a T-shirt with the Canadian flag on it, and the woman was keeping one eye on the eight-year-old boy dribbling a soccer ball nearby. “Maybe you don’t,” the boy retorted, sticking out his tongue. “I told you I didn’t want to come on this stupid ship!” With that, he kicked the ball into a column. It bounced off and almost hit a passing woman. She gestured toward a good-looking young Asian guy standing nearby. Tobias’s parents thanked her, then grabbed their son’s hand and dragged him toward the youth coordinator. She was writing the deck and cabin numbers down on her card when a sudden, shrill scream rang out from somewhere farther along the huge deck area. “What was that?” George exclaimed.